Remember this children’s nursery rhyme? Monday’s child is fair of face; Tuesday’s child is full of grace; Wednesday’s child is full of woe… which had a description for a child on each day of the week? It is believed that the signs of the zodiac can give us great insights into our day-to-day living as well as the many talents and special qualities we possess. Therefore, horoscopes could also be used to learn about your child as each sign of the zodiac symbolizes the characteristics and qualities inherent in his or her basic nature. Sweet, affectionate and cuddly – you can expect all these from a Taurus Baby. In return, be sure to shower your baby with loving caresses, for this baby likes to be swaddled and held and made to feel safe. Children born under this sign love to experience the world through their senses – they like the way things taste, feel, sound and smell. At the same time, they also love the outdoors, so introduce your baby to the outside environment as early as possible. Encourage the harmonious and diligent nature of your Taurus child with a small garden or animals to care for on their own. 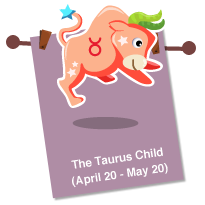 Taurus children take things in stride and work at their own pace. So, don’t hurry them along, but rather adjust to their schedule.